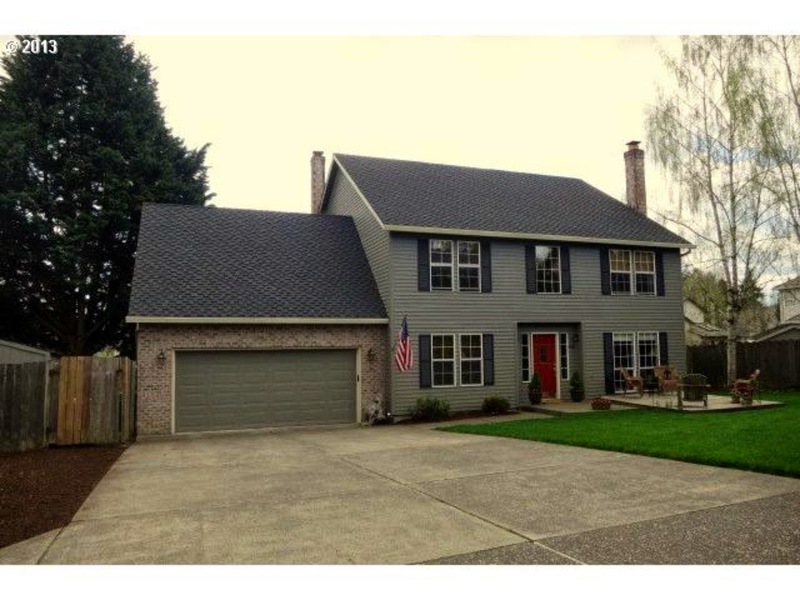 When hunting for a home we originally wanted 4 bedrooms PLUS a bonus room. As I looked at home prices in the location we wanted (a very desireable location) I quickly was forced to change my "priorities". 4 beds + a bonus was waaaaaayyyyyyy way way WAY out of our price range. It wasn't going to happen. This home is 2600 sq ft. 3 beds + bonus. I like to use my bonus rooms as a bonus space (AKA: lock the kids in the bonus room and forget about them destroying things, so I can get some peace and quiet for 5 minutes), so that meant my 4 kids would be sharing. My sweet daughter can kiss her pink girly private room GOODBYE! She is now sharing with #4. As I write this we are building the Built in Bunks. They are all over Pinterest, you can't miss 'em. 2. Create a private space for my daughter so she can still have her alone time before bed amidst the boys screaming and running around naked after baths. 3. Are just awesome looking! I will post our progress. But just to warn you... it will be slower than slow. We have 4 kids now. I teach ballet, run my own photography business, and I am still unpacking boxes! I am insane. Why am I even doing this blog?! I'm Back & Ready to Rock & Renovate!!! I needed a fresh new start after my long 3+ year hiatus (story below). My style has evolved and changed, as it should. I think we all moved on from band aid colored walls and fake ivy on our kitchen cabinets! When thinking of what to rename my site I wanted something with personality, depth, craziness and a little silly. Cause that's what my family is. We are controlled chaos (ok, NOT controlled. just chaos). As I was brainstorming, I quickly thought of the conversation I had with my 8 year old daughter a couple nights ago. She was beaming with joy as she was telling me about her new school. After a hard summer of moving twice, and another move ahead, she had finally felt settled. She found friends and I had not seen her this happy in months. It was quite the change from her moping around self just weeks before. She mentioned her school friends had formed a club and met at recess. I asked her what she called the club. So cute. I couldn't get that out of my head. Was it the name I liked so much or just all that happiness in my daughter's face when she said it? Who cares. I felt the same way. After 3 years of moving and feeling a little lost and a lot lost at times we were finally going to be settled. Our family had a home of our own. The Dizzy House was born. Now what happened to me from the the last post in 2011 up until now? Twins turned two. I went insane. Something had to go. My photography business exploded. House blog fell off my "want to do" list to "I can't do right now" list. Got prego with #4. Yes, it was planned. Morning sickess was all day and all night sickness. Husband got transferred to Pullman Washington (you don't even want to know...) so we moved. Rented our "starter home" out and moved into a rental, ourselves, for the next 2 1/2 yrs. Tears were shed at the thought of renters using my new kitchen. More tears were shed at the site of the horrendous rental I was forced to live in (we won't go there, long story..). Laid in bed all day sick with pregnancy. Gained 80 lbs with my pregnancy. I learned to sew curtains and pillows (now that alone was worth it!). Had the Baby! YAY, not sick anymore! Moved again from one rental to another. Just shy of being homeless. And... drum roll.... after 2 1/2 years in isolation, living where no Target is within 100 miles, we got the news we were being transferred back to PORTLAND! Tears of joy were shed. Kicked my renters out of our Starter home to get it ready to sell. Cried when I saw what renters did to my home. Revamped my home in 2 weeks, to get it staged and ready to sell (that's a blog post in itself!). Listed my home on our own. Sold it in 35 days. Made a good profit. The day we were moving into our rental, literally carting our stuff into the rental house, we got wind of a home that just listed. Ran over to see it. Loved it. Made an offer that day! This adorable, perfectly charming colonial became mine on October 7th, 2014. This home is the light at the end of the 3 year tunnel. It is a big gift that I have been wishing for and I feel so lucky. This colonial is like a girl that is cute, but could be a real smokin hottie, she just needs my touch! She has great bones, and SOOOO much potential I can hardly contain myself! Lucky for me, I convinced my husband of all her glory and potential and he was on board from the get go. I am going to turn her from a bad 90s hairday into a classy, traditional/transitional, gorgeous, comfortable colonial home. I will be painting every. single. surface. Ripping out almost every. single. thing. And because we only pay cash for our renovations, it will all be DIY! I'm back and we got a lot of updates to do! Can't wait to share!! 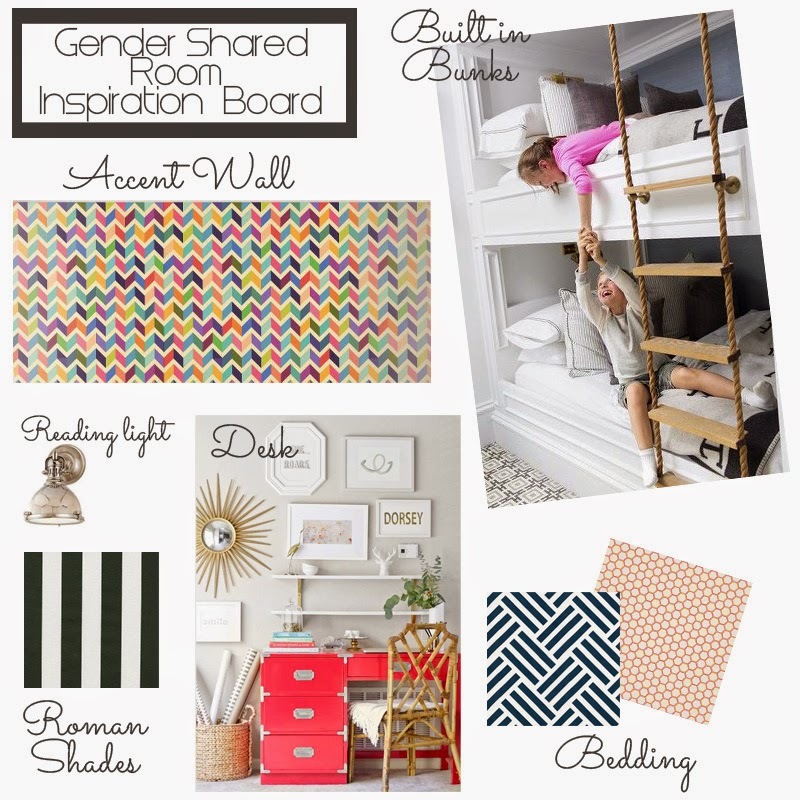 Built in Bunk Beds: Boy/Girl neutral classic shared room. Lets face it, times are tight. Are our homes really where we should be spending the money that we could be saving? I don't think right now is the best time for that (beyond what we have already done). The reality is, we need to be saving. My husband is still driving the '87 Toyota pick-up he drove to High School. I think it's his time for a nice little "renovation". It is his turn to buy his "dream truck" (the dream truck in our budget). My dresser can wait, my ottoman with matching pillows and my master bathroom will definitely have to wait until the housing market picks up again and I can see a reason to spruce things up with the hope of a nice return. My husband gave me my dream kitchen so I will give him his dream truck. Summer is here (I can't tell by the dreary weather in the NW) and berry picking season is on! I make strawberry jam every year with my dad. 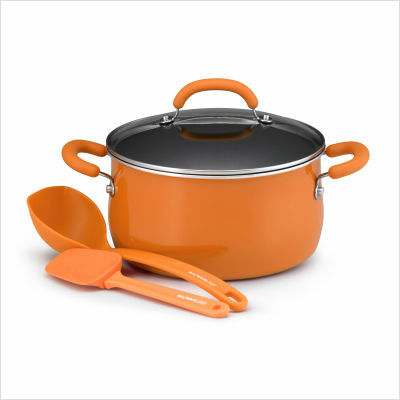 Well, this year will be a whole lot better because CSN, and their sister sites that have anything from decor, vanity, and office, has given me the opportunity to review their darling Rachel Ray cookware from cookware.com (you all know how I am obsessed with Rachel Ray cookware). I will be cookin my jam in this big pot this year, I can't wait!!! Not to mention the orange will just POP in my newly renovated kitchen. Wanna come over and can with me? I can't tell you how pleased I am with the final result. Our projects ALWAYS come out BETTER than we had planned. Remember how I originally had picked, and purchased, Tumbled Travertine as my backsplash? Well, my gut told me it was wrong, so I returned it and traded it for Porcelain, dark and contemporary tiles. LOVE IT!!! That was the best choice I made. And I am SOOOO lucky that Oregon Tile & Marble made the exchange, THANK YOU! My $10 Valances above my corner sink fit right in. I am in love with my elegant Faucet that reminds me of Swan Lake. I can't believe I actually wanted to return it. I have fallen in love with it more everyday. I got it at Lowes for $200!! No, this knife set isn't new. I just spray painted the wood Oil Rubbed Bronze. A quick fix for it to look sleek and new. See the "old" knife set to the right? I wanted to add some accessories on the top of my cabinets. Just because I can't accesorize within 2 year old reach I had fun with this one! I still feel like I need to tweek it a little bit but I have time for that. I had to get that green in. Love that green. The Kitchen Renovation was UNDER $3000 for the whole thing. I know, amazing. The Cabinet Paint color was a color match of Behr's Powdered Snow in Sherwin Williams Oil Based. Pam and Brian with Interiors Plus Flooring were the heroes in making this happen, THANK YOU! And a BIG THANK YOU to my sweet husband for pulling through. It was worth it!